We got out of Slov’ians’k. Brief description. It’s murky. The atmosphere in town is like a movie about World War II. I can tell you with full certainty that a special operation by the Main Intelligence Operations (GRU, affiliated with the Russian Army – translator) took place there. Separatists had blocked off the city from all sides. The local authorities are saboteurs, traitors, and criminals’ henchmen. There are two echelons at the separatists’ block posts. The first one is made up of elderly people, women with icons, etc. Behind them are out-and-out hoods, wearing helmets, holding bats and pistols. It’s awful to say this, but a lot of them are simply people poisoned by Russian propaganda. There are drunks and completely indecent types. And then a regular army in fact stands in the perimeter behind those block posts and barricades. “Little green men,” terrorists in infantry camouflage calmly wander around with automatic rifles, grenade launchers, and machineguns. They are aggressive to the extreme. They don’t care if it’s women or old people. They search them and beat them up. In a word, they’re occupiers and barbarians (I said this live on Espreso TV). What makes the anti-terrorist operation complicated is that there could be collateral damage. So not everything looks as simple as it seems. I could imagine things could be like this, but I never imagined such open displays of fascism and banditry in Ukraine. So that you understand what’s going on, separatists searched our car six times. To go through town, we had to hide our vehicles and wear scarves up to our ears and raise up our collars, because we always looked suspicious to the militants… It was something unreal… On the other hand, we had the opportunity to talk with many residents. They were terrified, disoriented, but they are against the separatists. They are against the occupiers. Thus, let’s not lose hope. We need to work with people. I’ll tell you straight out, in Kyiv this looks like a “movie,” but when you get here, you understand that this is another reality, a frightening one. Right now we are in Kramotors’k. We went to get something to eat. 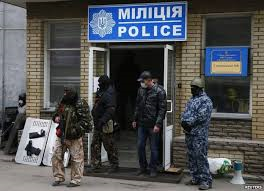 Here, too, GRU agents seized the local police station, the Security Services of Ukraine (SBU), and the town council executive committee, but right now, only the most fanatic town residents and rabble support them, and there aren’t many of them. Thus, the situation in Kramators’k is much more peaceful, and you don’t feel the state of panic and rushing around that’s in Slov’ians’k. We’re driving on. I want to go through all of the Donets’k Region, down to Mariupol’ so that I can see and figure out the complete picture of what’s going on here. But there’s one conclusion I can make without any more doubts – it’s the Kremlin, the Federal Security Services (FSB) of Russia, and the GRU. Let’s hang on and fight for Ukraine’s unity and harmony! And there are no doubts that they won’t break us up; we’re going to win! I will try to provide further information later.